Maybe you’ve seen them in the supermarket. Or maybe you’ve seen the ads. Maybe you were skeptical. Or maybe you thought, Cool! We’re talking about plastic bottles that are made from plants. Dasani’s PlantBottle is one. The claim on the bottle and on Dasani’s website, which shows an image of a water bottle emerging from a dew-flecked green leaf, is that its plant-based PET (polyethylene terephthalate) bottles are made from up to 30 percent plants and are 100 percent recyclable. But buyers of Rhode Island’s post-consumer plastic consider plant-based PET plastic to be a contaminant, according to Sarah Kite, director of recycling services for the Rhode Island Resource Recovery Corporation (RIRRC). "Until they (our buyers) tell us that plant-based plastics are OK, we have to say that they are not recyclable in Rhode Island," Kite said. For now at least, the place for Rhode Islanders to put these bottles is in the trash, not the recycling bin. Perplexed that Dasani’s marketing claims weren’t matching up to reality, ecoRI News contacted Steve Alexander at the Association of Postconsumer Plastic Recyclers (APPR), a national trade association representing companies who acquire, reprocess and sell more than 90 percent of the post-consumer plastic in North America. Alexander, who said APPR worked with Coca-Cola, Dasani’s parent company, to design the PlantBottle to meet current recycling specifications, was blunt when told that RIRRC’s customers consider PET made from plants to be a contaminant. “You’ve gotten some bad information,” he said. To make sure the facts were right, ecoRI News contacted its science expert and composting guru, Michael Bradlee, founder of Earth Appliance. He backed up Alexander's claim. "Purified chemicals do not retain any memory of their origin; monoethylene glycol (MEG), one of the components in PET, derrived from petrolium is absolutely identical and cannot be distinguished from plant-based MEG," Bradlee said. ecoRI News went back to Kite, who stood by her earlier statement that plant-based PET is not accepted by RIRRC customers at this time. And so, with Rhode Island rolling out its new single-stream recycling system this week, a system that aims to simplify recycling for residents and calls on them to put all plastic containers of 2 gallons or less in their recycling bin, we already have an exception to that rule. Actually, we have a few, all of them bioplastics. PET plastic made from plants, along with PLA plastics and biodegradable plastics, are all considered trash in Rhode Island, at least for now. Head spinning yet? Welcome to the complex world of bioplastics. Bioplastics have been around since the 1950s, but with awareness growing as to the scourge of traditional fossil fuel-intensive plastics and with the cost of petroleum on the rise, companies such as Coca-Cola and Pepsi are looking for alternative ways to create plastics and, parenthetically, a marketing buzz. Because they rely less on greenhouse-gas emitting fossil fuel and more on renewable plant-based sources, bioplasics are generally considered to be more sustainable than traditional plastics. A bioplastic can have one or all of the following attributes: bio-based (made from plants), biodegradable and/or compostable. Currently, bioplastics represent less than 1 percent of all plastics on the market today, but you can expect that percentage to increase as new innovations come online and as more companies adopt bioplastic packaging. The Dasani bottles mentioned above are PET bottles. PET is made up of two components: monoethylene glycol (MEG) and terephthalate. MEG accounts for 30 percent of the weight of PET and this is what Coca-Cola, with its PlantBottle, is producing from plant sources, such as sugarcane grown in Brazil. Historically, MEG was created using petroleum. Odwalla, the smoothie-producing subsidiary of Coca-Cola, now sells its drinks in an HDPE, or high-density polyethylene, plastic bottle made almost entirely (at least 96 percent) from molasses and sugarcane. Though the raw materials for plant-based PET and HDPE come from renewable, lower-carbon sources, the resulting plastics are chemically identical to traditional plastic bottles. And, as plastic, the plant-based bottles carry all the same environmental impacts as those made from fossil fuels, and they don't biodegrade. So, are they better for the environment? That is a complicated question and one that depends on how the plants used to make the plastic are grown: Are they grown with petrochemicals? Are they produced from GMOs? And so much depends on the afterlife of the bottle — in Rhode Island plant-based PET (and HDPE) bottles go in the trash. Even in states or municipalities that do recycle these bottles, manufacturers typically peg the recycling rate for PET at 27 percent. And so, even if a PET bottle made from plants isn’t front loaded with carbon, it could still wind up in a landfill, or, worse, in the ocean, where it will pollute just as a traditional plastic bottle would. Biodegradable plastic, a plastic that can be plant or petroleum based, is appealing to consumers because there is the promise that the bottle they’ve just purchased will — Presto! — disappear. ENSO Plastics, an Arizona-based company that produces one such biodegradable plastic bottle, claims that its bottles are biodegradable in both landfill and compost environments. The company creates material for its bottles by injecting the polymers that make up plastic with additives that attract microbes, which, in turn, break down the plastic. But not much breaks down in a landfill, which lacks oxygen. And, even if biodegradable plastics do break down in this oxygen-free environment, they emit methane, a greenhouse gas 23 times more potent than carbon dioxide. 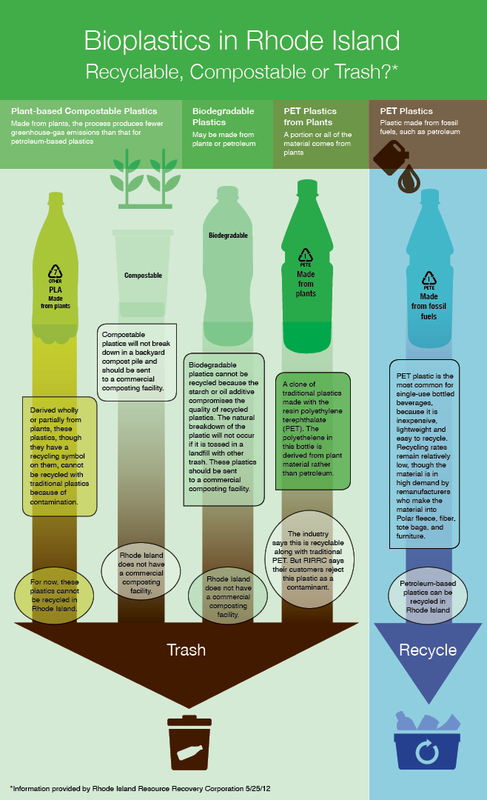 To properly degrade, biodegradable plastics need to be sent to a commercial composting or anaerobic facility. But, most places, Rhode Island included, lack such facilities. Because of the biodegradable additives, these plastics are universally considered to be a contaminant among recyclers. "It is difficult to impossible in some cases to properly identify the plastics with the additives," Kite said. "This means that all the selected plastics are sent to the remanufacturer. The plastics with additives are reblended into the new plastic, compromising the plastic's integrity." There also is concern, among environmental groups, that biodegradable plastics may actually encourage litter and increase consumption if people think that these plastics will degrade. You’ve perhaps seen compostable plastic at eco-minded cafés, where compostable to-go cups are used for iced coffee or other cold drinks. These cups are made from PLA, or polylactic acid. Producing PLA uses 65 percent less energy than producing conventional plastics, according to an independent analysis commissioned by NatureWorks, the Cargill-owned company that produces PLA from corn. PLA is said to decompose into carbon dioxide and water in a “controlled composting environment” in fewer than 90 days. A controlled environment is a large facility where compost reaches 140 degrees for 10 consecutive days. But again, here in Rhode Island, residents have no access to commercial-scale composting, and so the promises of compostable plastic breaking down are fleeting. Instead, these plastic bottles are either erroneously put in the recycling bin, where they are considered a contaminant, or tossed into the trash and ultimately buried in the landfill, where they will not break down at all. "Here at our MRF (materials recovery facility), we are unable to sort for PLA or bioplastics, just as no other MRF is able to do," Kite said. "Keep in mind how biodegradable works: You need the proper conditions for materials to break down (air, light, water), and in a sanitary landfill, those conditions do not exist. Compostable plastics need to be composted in a commercial composter, which doesn't exist in Rhode Island." Is there a great future in bioplastics? The marketing claims on bioplastics ring hollow in Rhode Island. And all the green ad-speak hoodwinks uninformed consumers into thinking they are being environmentally responsible by purchasing these materials. For now, bioplastics in the Ocean State, be they compostable, biodegradable, recyclable or all three, are considered trash. But this could change if the market shifts to accept bio-based PET or if Rhode Island gets a large-scale composting facility. If these “ifs” come to fruition in Rhode Island and elsewhere, bioplastics might offer some solutions to the scourge of plastic waste. Athena Lee Bradley, projects manager at Northeast Recycling Council Inc., a multi-state organization committed to responsible solid waste management, is skeptical of bioplastics. "There has not been enough research done to know what kind of an impact these bottles will have on the recycling stream, so any company marketing and selling the bottles, is in my opinion, being irresponsible," she said.